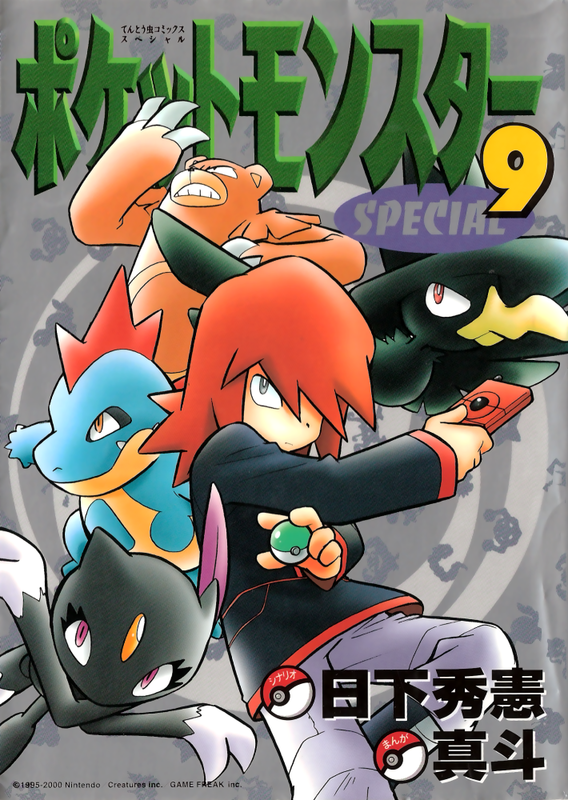 Silver and his Pokémon team, as he appears on the cover of a volume of the Pokémon Adventures manga. At the beginning of this retrospective, it was discussed how, in Pokémon Gold and Silver, Sneasel is the last Pokémon that the player gets to meet in the wild. However, its appearance won't come as a complete surprise, as the player will have necessarily met a Sneasel before - most notably under the ownership of the player's rival, who is known with the fandom name of Silver. This particular Sneasel is shown to the player rather early in the game, making it kind of a tease. There are a few things to say about this particular Sneasel. If Sneasel can only be found at the very end of the game in Mount Silver (name purely coincidental), which is off limits to everyone but the most competent of Pokémon Trainers, how come the rival has managed to acquire one? This is no oversight. There is actually a reason: that Sneasel was kidnapped. 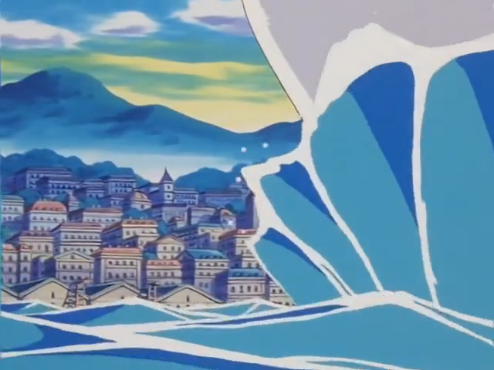 Cianwood City, as depicted in the anime series. In Cianwood City, the player will meet a man who collects rare Pokémon. He will say that one of his prized Pokémon has been stolen by a red-haired boy, and so he will entrust the player with his other Pokémon for safekeeping: a Shuckle which would be unable to withstand its own without its partner. The next time that the player meets Silver, his team will have gained a new addition: a Sneasel. Knowing this little bit of backstory, one can come to the conclusion that Sneasel was the Pokémon which was stolen from the collector. Considered that at the end of the storyline Silver ends up redeeming himself, how come he never returns that Sneasel to the owner? This is my own conjecture, but there is a possibility that Silver did indeed try to atone for what he had done, but Sneasel's original trainer allowed Silver to keep it - much like what happens when the man asks the player about his Shuckle: if it turns out that it has become friendly with the player, he will allow them to keep his Shuckle. Maybe the same happened to his Sneasel, considered that Silver's entire story arc is about coming to understand that Pokémon are not tools or objects. 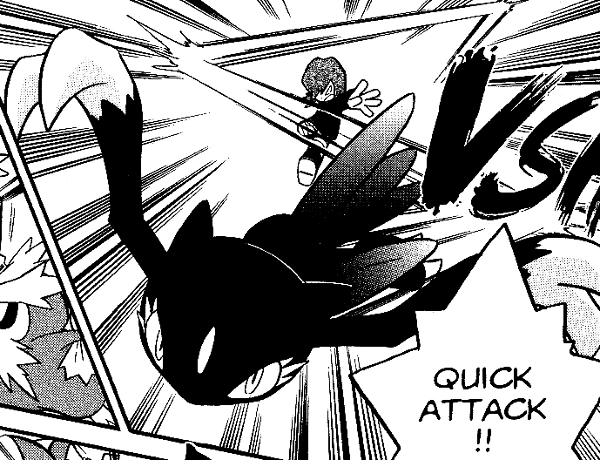 Silver and Sneasel, as they appear in the Pokémon Adventures manga. 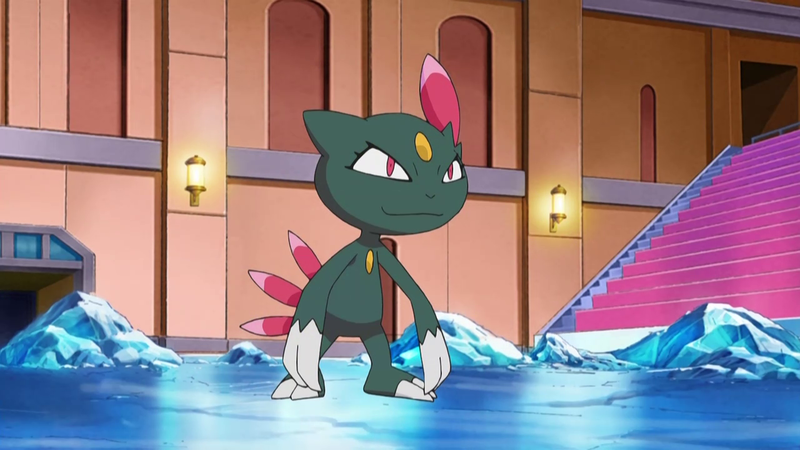 In the several incarnations of Silver in the Pokémon manga series, Sneasel is often portrayed as his most important Pokémon, like Ash Ketchum's Pikachu in the anime. In Pokémon Adventures, Sneasel is Silver's first Pokémon, and the one he's closest to; he's his partner in crime and best friend. In battle, his Sneasel is a fast, reliable fighter; outside, he's quiet, but always caring. His Sneasel has been with him for longer than he can remember, and is the only connection to his past that Silver retains. Candice's Sneasel in Snowpoint Gym, as it appears in the anime series. 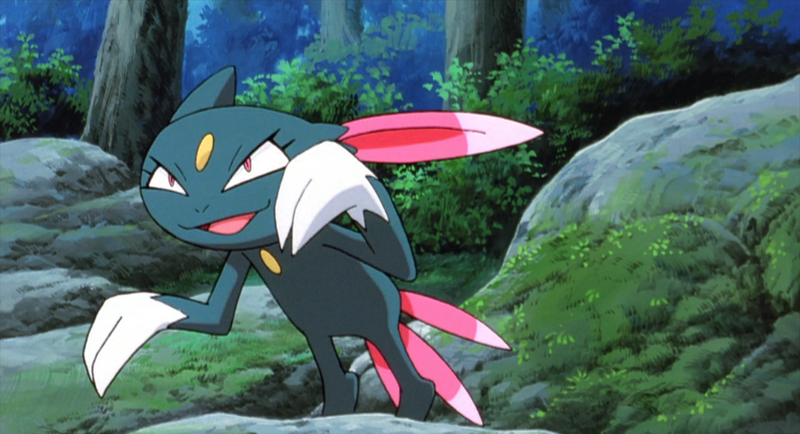 Other than being connected with Silver, Sneasel also appears in the games and in the anime series under the ownership of other important Trainers. One such Trainer is Candice, the Gym Leader of Snowpoint City in Sinnoh. She is a master of the Ice-type, and Snowpoint City is the northernmost city of the northernmost region in the Pokémon world; wild Sneasel can be found easily in the wilderness around the city and in the Snowpoint Temple, so it is no wonder that the Gym Leader has one herself. There are very few masters of the Dark-type in the Pokémon world. Karen, the last of the Elite Four in the Johto League, is one of such masters, but...two out of five of her Pokémon aren't even Dark-types! She does not have a Sneasel, but when rematched in Pokémon Heart Gold and Soul Silver she does have a Weavile, so it's implied that, at some point, she must have had one. Same goes for Pryce, the Ice-type Gym Leader of Mahogany City; in certain tournaments, he has a Weavile. Vicious's Sneasel, as it appears in Celebi: Voice of the Forest. As for what concerns anime appearances, Sneasel has made it on the screen a few times - mostly under the ownership of Harrison, a rival of Ash Ketchum. A few other less important Sneasel have appeared under the ownership of evil evil villains, because villains train Dark types, of course. The most notable of these appearances was in the movie Celebi: Voice of the Forest, in which a guy literally named Vicious had one. Vicious. If nothing else, this means we got to see movie-quality Sneasel battle around.